On Feb. 29th, the lunch event of CNAICO new leadership’s execution announcement was held in the 19th Floor Conference Room of Sinomach Headquarters. 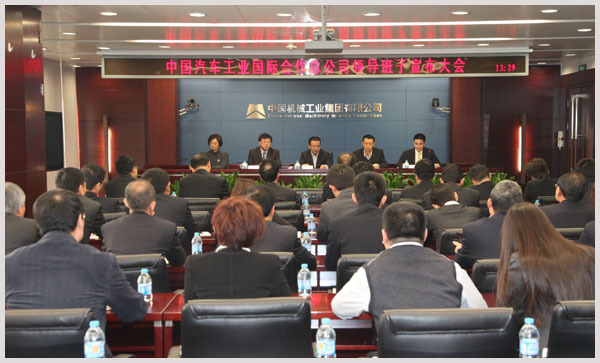 Vice President of Sinomach, Ding Hongxiang, Manager of HR Department and the Party Committee Organization Department, Han Xiaojun attended the meeting. All the CNAICO middle level and above managers were present. Decided upon by Sinomach, Mr. Ji Xuecheng will serve as the President and secretary of the Party committee, Jing Yongjian as the Vice President and Zhao Shuangjun as the Chief Financial Officer. According to the demands of CNAICO’s following restructuring, Sinomach decides that Zhang Fusheng, Yu Benli, Ji Xuecheng and Peng Mingjing will serve as the directors and Zhang Fusheng will serve as chairman of the board, Qian Wei as the member of board of supervisors and the proposed Chairman candidates of the board of the supervisors. Vice President, Ding Hongxiang made a brief introduction to the arrangement and going of the change of CNAICO leadership and Sinomach’s work deployment of its affiliate restructuring in his speech. Meanwhile, he also put forward a four-point hope and requirements. First of all, take operation target as the fundament to promote a steady development. Secondly, seize the opportunity of the building corporate governance structure to set up the scientific and standardized deciding and operation mechanism. Thirdly, take “miyoshi leadership” as the standard to strengthen the building of the leadership. Fourthly, CNAICO Party Committee should play the role in leading, promoting, assuring and supervising to ensure the steady running of leadership adjustment. With the leading of the board of directors and supervisors and the guiding of the management team, CNAICO is been looking forward to take company’s restructuring as an opportunity to make a new future. VP Ding Hongxiang also expressed that the leadership of Sinomach and relative departments would be always the strong background to support CNAICO’s developing. President Ji Xucheng made his inaugural speech with 4 key words which were “being grateful, cherishing, striving and responsible”. He expressed appreciation to the trust from Sinomach leadership and CNAICO cadres and employees and he would cherished this trust and live up to everybody’s expectation. Being an honest, hardworking and dedicated man, with doing things steadfastly and forging ahead, he would try his best to finish his own work. Mr. Ji’s speech also presented that he would implement board of directors’ decision and be a good class monitor to squad well. Focusing on making good use of every cadre and employee’s enthusiasm and creativity, relying on the management group’s strength strictly, Mr. Ji would like to create a new situation and contribute to Sinomach’s development.